Domain Name System (DNS) is an Internet service that translates domain names into IP addresses. For example, the domain name www.linksys.com will have a DNS server address that is equivalent to 66.161.11.93. Access the router’s web-based setup page. For instructions, click here. 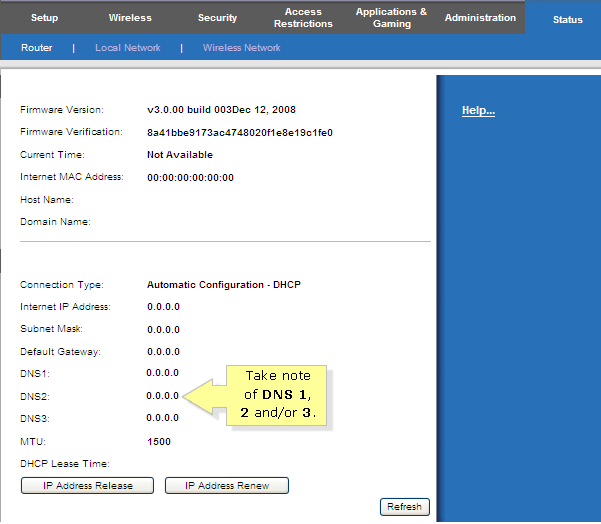 If you are using a Mac® computer to access the router's web-based setup page, click here. Take note of DNS 1, 2 and/or 3. These are the DNS server addresses that the router is getting from the modem. To verify if the DNS server addresses appearing on your router are valid, contact your Internet Service Provider (ISP). QUICK TIP: Getting valid DNS server addresses is one of the ways to check if your Internet is working. You can now use the DNS server addresses to either set up a static IP address on your computer or configure the settings of your gaming console. QUICK TIP: If your ISP require you to manually enter an Internet IP address, Subnet Mask, Default Gateway and DNS on the router to have Internet access, you can click here for instructions on how to configure it properly.